Now that you understand the selection process for a batch powder coating operation, it’s time to determine if a batch line or automated coating system is the right solution for your operation. Are you launching a large coating operation from scratch and can’t decide what type of line will work best? Have you been powder coating with batch equipment but need to increase throughput? Perhaps you’re bringing powder coating in-house to finish the products your company manufactures, but you’re not sure how to do it. The decision to install an automated finishing system is a considerable one. Before you make the investment, you need to ask yourself if an automated system is right for your company’s operation style and daily coating requirements. The number one reason to move from a batch line to an automated coating system is to increase throughput. If your business needs to produce a high volume of powder coated parts on a daily or weekly basis, and these parts are somewhat similar in size, you should consider installing an automated line. Since automated coating is a continual process, you’ll almost always be able to coat more parts in a set period of time than if you coated them manually in small batches. But, many problems with throughput can be resolved with less expensive batch equipment. If you already have a batch system in place, and your production quota is exceeding your current throughput, determine if there is a bottleneck slowing down your operation. If your bottleneck is at the cure cycle, can you add another oven (https://www.reliantfinishingsystems.com/powder-coating-equipment/powder-coating-ovens/) to improve your capacity? If you’re losing time loading and unloading the parts on racks, is it cost effective to add more employees or build more racks? Evaluate your current system and see if you’ve done all of the simple and affordable expansions to your current operation. Bring in a consultant if you need expert advice. Sometimes a simple fix, like adding another gun or hiring an assistant for your coater, can significantly increase your throughput. If you have already upgraded your batch system and solved all of your bottleneck and speed issues, investing in an automated line is the next logical step to increase production. If you need stringent quality control, an automatic line provides repeatable and consistent finish quality that is tough to match with a manual coating operation. Automatic gun systems from companies like Wagner, Nordson and Gema can be programmed to apply specific amounts of powder at just the right setting for best coverage. The process can be repeated automatically for each part. As long as the equipment is properly maintained, the results are ideal and consistent. If your current manual approach is too erratic because your coater is having trouble keeping up, or your customer’s finish requirements are very specific, an automatic system can provide highly consistent results when properly operated and maintained by skilled employees. There are several common finishing specifications that you may be asked to meet in order to capture and retain a client’s business. Some of these finish standards require you to employ a specific pretreatment process to achieve acceptable results. Others may simply require finished parts to pass a durability test. Depending on your industry or your end-customer uses, your powder coated parts may need to meet national specifications before they can be used in the field. Each standard requires more extensive pretreatment and powder quality processes than the lower one. For example, the 2603 specification can be passed by a manual operation, but the 2604, and definitely the 2605, require an automatic pretreatment process (usually of 4-5 stages or more). Dip tanks can work for specialty parts, but if you are looking at part counts of 1,000-2,000 per day, manual solutions are just not practical. Hanging parts on an automatic line is the most efficient way to prepare large quantities of them consistently. Knowing your production requirements and parts specifications makes your system decision process much simpler. Cost management is an integral part of efficient production. Reducing labor costs on a per part basis can propel a company forward. Automatic lines can almost always reduce the amount of labor required when compared to their manual counterparts, but there is a minimum of how few employees it takes to run an automatic line. Typically in a small automatic line you will need someone to load the parts, another person to run the automatic spray booth and perform manual touch-up of problem areas, someone to inspect/unload the parts, and a finish line manager who makes sure the employees are doing a quality job and the equipment is running properly. At least one person needs to know how to adjust the pretreatment section and how to maintain the equipment so that the line remains operational. A minimum of 3-5 employees is recommended for even a small automatic line. Automated lines are sized based on the largest, densest parts that will be coated. The pretreatment and curing processes are often calibrated to get premium results with specific parts. Shops that routinely deal with parts that are in the same general size and density range are the best suited for automated coating lines. If you have parts that are substantially different in size and density (such as 10’ long sections of 3” wide railing, heavy 15” by 15” by 20” machine parts and thin 4’ by 4’ by 4’ pre-assembled frames), an automated curing line may not be practical. Although a single automated system can be set up to accommodate all of these parts, the costs to buy and operate it may be prohibitive. The other consideration that may make an automated system impractical is if your company does not operate in a fairly consistent way from day to day. Specifically, if jobs are frequently being leap-frogged in line ahead of other work or your operating hours vary widely from day to day. It takes a while to get an automated system up and running, and it takes longer than batch equipment to shut down at the end of the day. Shuffling parts around, changing set-ups and re-starting the line can quickly offset the benefits that make an automatic line effective. 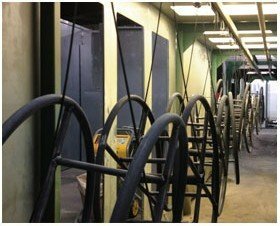 Automated powder coating lines get the best results when they are used in a consistent and routine manner. If you can satisfy your production and cost requirements with a batch system, you are better served with the flexibility and lower cost of a well-made batch system. However, if your production quotas or part specifications require it, an automated line may be the obvious solution. We always recommend that you have a clear understanding of your production goals before making a system purchase. If you’re still debating whether you need an automated powder coating system, here’s a summary of the benefits and drawbacks of an automated line, as compared to a batch system. Less flexibility: Parts have to be hung on line in a specific way. Parts are also limited to a certain height, length or width. Changes to any aspect of the coating process can cause costly downtime. Color changes are more difficult: Reclaim booths are usually for just one color unless you buy a cyclonic or equivalent type powder recovery system. Even then, changing colors is not easy in a reclaim operation. A spray-to-waste booth positioned in line immediately after a reclaim booth is not uncommon, but this increases the total equipment cost as well as the footprint of the installed equipment. Increased training expense: Automatic equipment requires better educated, well-trained employees to operate it. Employee retention is important after they have been trained because of potential downtime when dealing with new hires. Increased maintenance: Automatic lines must be vigorously maintained or they won’t function correctly. Poor maintenance practices can lead to lost production time and wasted labor waiting on the line to be fixed. A problem anywhere is a problem everywhere: Unlike batch systems, where the processes are isolated, a failure in one area of an automated system causes a backlash throughout the line. If a coater has a serious problem in the powder booth of a batch line, other parts can still be prepped and cured while the problem is addressed. If there is a problem in the spray booth of an automated line, the other processes will also come to a halt as soon as the conveyor is stopped. Careful cost analysis should be performed before deciding on an automatic finishing system. Automatic lines can be very beneficial and improve profitability but their functionality is very specific. They are simply not as versatile as manual batch systems. Pretreatment stages, amount and type of powder to be applied, curing schedules and cool down times must all be calculated before the equipment is manufactured. If you’d like to learn more about the various types of powder coating media, the common steps in chemical pretreatment, and other helpful information that must be taken into account when specifying an automated system, check out our other articles by visiting our Resources page. This entry was posted in News on September 17, 2015 by Bruce Chirrey.